2019-02-04 12:20:232019-02-04 12:20:23https://quickbooks.intuit.com/in/resources/hr-and-management-human-resources/what-is-employee-turnover-and-why-bother/HR and Management: Human ResourcesEnglishIf your entity is witnessing voluntary employee turnover, you need to understand the reasons. 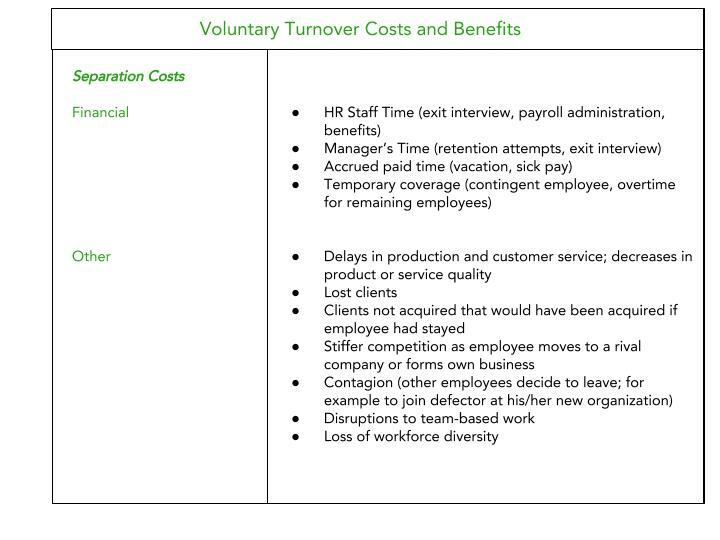 Here's all you need to know about what is...https://quickbooks.intuit.com/in/resources/in_qrc/uploads/2019/02/What-is-employee-turnover-and-why-bother.jpghttps://quickbooks.intuit.com/in/resources/hr-and-management-human-resources/what-is-employee-turnover-and-why-bother/What Is Employee Turnover: And Why Bother? “Infosys announces that CFO MD Ranganath has decided to step down to pursue professional aspirations”. The above statement made headlines immediately after Infosys issued a press release on August 18, 2018. The publication showcased acceptance of the senior executive’s resignation. He served Infosys for more than 18 years. This was the third senior executive departure under Salil Parekh, who took over as CEO in January. The departure of Ranganath added another member to Infosys’ burgeoning attrition rate that reached 22.2% in the Quarter of September 2018. Despite instituting varied employee engagement strategies, Infosys’ voluntary employee turnover level has not come down. Besides, such retention efforts have impacted the profitability of Infosys for the Quarter October 2018. Despite benefit from rupee depreciation and lower visas cost, the aggregate benefit was offset by compensation increases. Like Infosys, if your entity has been witnessing soaring voluntary employee turnover, you need to understand the underlying reasons. And accordingly implement strategies to retain talent whom you have been training and developing arduously. What are the different types of employee turnover? Why you should bother about employee turnover? Employee turnover refers to the number or percentage of employees leaving an organization during a certain period of time. Employees may leave your organization for a variety of reasons. Some get hired by other employers, some go back to school and some accompany spouse who has been shifted to a new place. Others quit job impulsively or retire or abandon working altogether after achieving a pre-set monetary target. While there are still others who get fired or laid off or come to a decision that they do not need the job anymore. All such instances indicate employee turnover. Each of the turnover cases mentioned above has its own set of implications on your business entity. Therefore, to differentiate all such implications, you need to first understand different types of employee turnover. Voluntary Turnover refers to the employee’s choice to willingly disengage with your organization. This means that such a turnover occurs when your employees choose to leave the organization. The reasons behind your employees leaving the organization voluntarily can be many. The primary ones include dissatisfaction with the job, conflict with a supervisor or seeking an attractive job offer. Moreover, such kind of turnover can lead to increased risk of losing your star employee. Involuntary Turnover refers to the discharge or termination of an employee by your organization. The reasons behind such a turnover include your employee’s poor performance, business slowdown, organization restructuring or behavioral issues. Such a turnover does not occur as a result of your employee’s unhealthy relationship with you on any grounds. 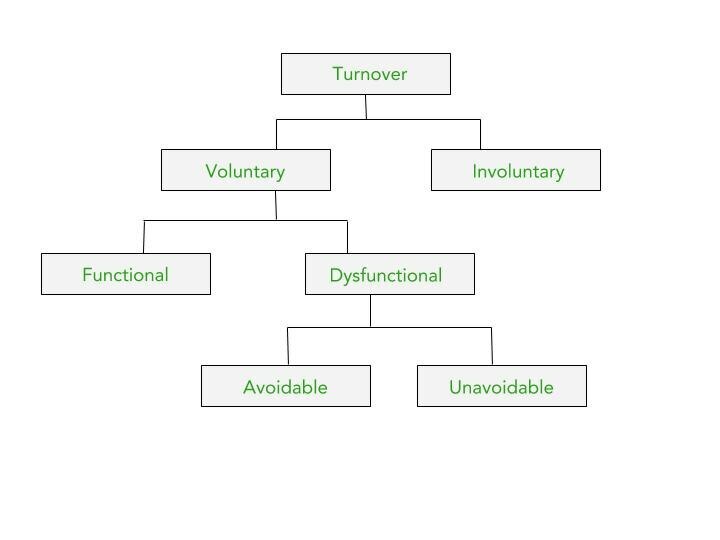 Voluntary Turnover is further bifurcated into Functional and Dysfunctional turnover. A voluntary turnover that improves the functioning of your organization is referred to as Functional Turnover. Such a turnover includes disengagement of employees who are either non- performers or part-timers with no unique skills. The loss of such a talent does not impact the effectiveness of work within your organization. Rather your company stands to benefit with such a turnover as poor performers are now replaced with better performers. Moreover, the quality of jobs thus affected improves over time. This means that with functional turnover, the benefits gained by replacing outgoing employees exceed the costs incurred. On the other hand, dysfunctional turnover is the one that disrupts the functioning of your organization. Such a voluntary turnover might include top performers whose performance has a direct impact on the profitability of your company. It may also include employees having skills that are unique and hence hard to replace. Additionally, such type of turnover may include employees belonging to a minority group, say women. Losing out such set of minority group employees can impact the diversity of your company’s workforce. Therefore, when your organization loses employees, who fit in any of the above scenarios, the costs incurred exceed the benefits gained by replacing such employees. The voluntary turnover can either be avoidable or unavoidable. The turnover that originates from the causes that your organization can influence is an avoidable turnover. The underlying reasons for such a turnover may be: 1) low job satisfaction 2) Poor pay or compensation 3) lack of opportunities to advance. However, unavoidable turnover stems from the causes over which your organization has no control. The reasons for such a turnover include: 1) family or health issues 2) shifting to a new location or 3) returning to full-time school. Now, since you know the types of turnover and their implications, it’s important to analyze why employee turnover matters. As a business owner, why you should care or bother about employee turnover within your company? According to Payscale’s Report, 59% of the organizations surveyed have called out employee retention as a major concern for 2018. Why Do Organizations Have Employee Retention as one of their Top HR Practices? As per Manpower’s white paper, there are rising concerns about an increasing talent shortage due to a host of factors. Such a shortage exists in the overall supply of talent. Additionally, such a shortage also exists in the specialized skills and competencies most valued by organizations. Therefore, organizations have been striving to manage retention in both good and bad times. Such a practice would make them fight talent shortages in a much better way. Moreover, evidence shows that high unemployment rates have little impact on the turnover of high-performing employees. Thus, it necessitates that employee retention management should matter even when voluntary turnover rates drop due to unfavorable labor markets. As ignoring employee retention would lead to a greater chance of losing valuable and high performing workers. 4) erosion of existing customer base. Table below lists the costs associated with the turnover of employees. It is important to note that not all turnovers are harmful. For example, the exit of non-performers is beneficial for your organization. Also, new hires, who turn out to be more productive than previous employees are good for your team and company as a whole. Therefore, while developing an effective employee retention plan, you must understand the turnover and its effect on your organization. You need to understand the turnover types, the costs and the benefits associated with each such turnover. An SHRM report mentions that there exists a negative relationship between employee turnover and organizational performance. The empirical studies showcase that high employee turnover has a harmful effect on efficiency, productivity, sales growth and safety of an organization. Likewise, low turnover rates have showcased improved sales growth and workforce morale. Additionally, studies have also shown that high involvement HR practices are likely to contribute to higher sales. Such HR practices induce employee commitment to the firm, thus lowering turnover. A low turnover would mean employees staying with the company for a long period of time. And such long term employees would contribute to maximizing sales directly. This is because they have a deep understanding of the company’s products, customers and work processes. Thus, high-performance HR practices create a valuable workforce that is capable of managing an organization’s customer base. Also, the relationship between turnover and organizational performance has been looked at with a much broader view. This view encompasses the impact of turnover on people’s social relations with organizations. Such a view implies that the loss of organization’s key employees can severely harm an organization’s social structure. Moreover, the turnover of employees with extensive social capital can erode an organization’s performance dramatically. Therefore, you need to customize employee retention strategies keeping in view the types of employees leaving the organization. According to a LinkedIn’s report, finding great talent for SMB’s is becoming harder. 41% of the respondents wish to stay with their company for less than 2 years. Another 37% believe they will remain at the company for 3+ years. Whereas 22% don’t know how much longer they’ll stay at the company. Also as per Mercer’s Global Talent Trends 2017 report, 77% of the employees surveyed are looking for job elsewhere. Another 34% employees say they plan to leave their current role in the next 12 months. This is despite of the fact that they are satisfied with their jobs. And equally concerning is the fact that the employees who do not wish to leave their jobs are less energised to work. Moreover, as per Manpower’s research, there is shortage of talent not only in the overall supply but also in the specialized skills valued by organizations. This is coupled by rising millennial workforce that is looking for growth opportunities early in their careers. Such workers tend to shift jobs more as compared to the older generation to advance in their careers. Moreover, technology makes it easier for people to find and apply for the jobs that match their skill sets. Additionally, side incomes from freelancing and self-employment opportunities are ending 9 to 5 jobs. In such a scenario, retaining employees becomes all the more challenging.